While there are various things that people collect, we collect watches. They are a subtle but, incredibly visual way to make a statement. 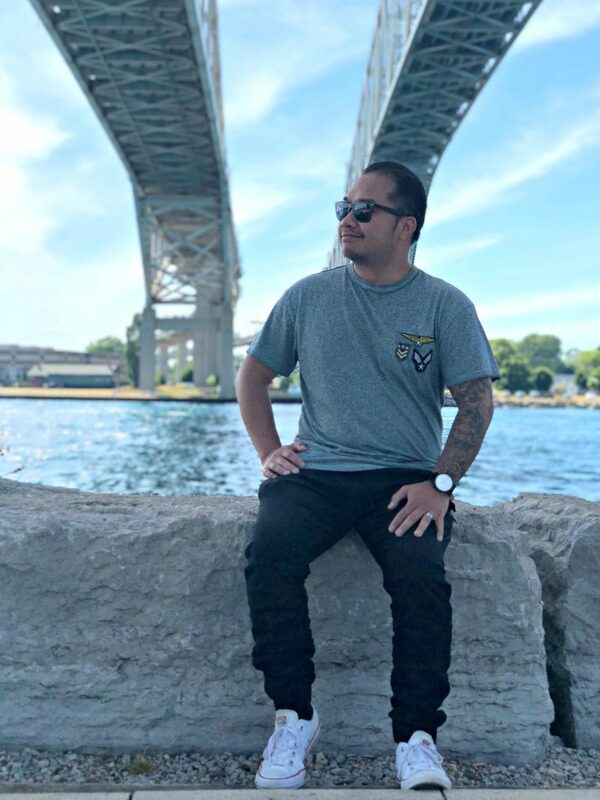 That is why Lux Woods watches made a huge impression on us because not only do they make stylish timepieces, they give back with every single watch. Darasak is a tinkerer and it’s no surprise that he enjoys something as intricate as a watch. He especially has a love for them and has been collecting them for years. 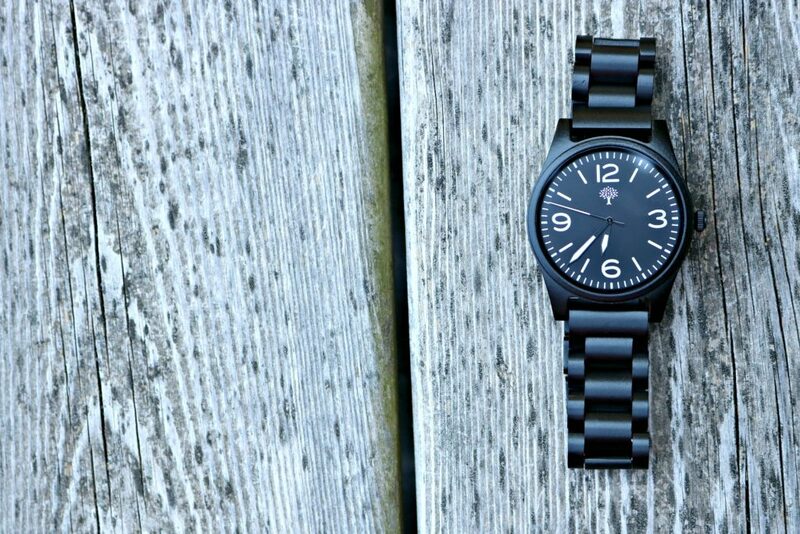 When we had the chance to review a couple timepieces from Lux Woods, he was stoked and ready to lend a helping wrist. Read on to discover why you’ll not only love wood watches for both men and women, you’ll love the uniqueness of Lux Woods watches. You’ll find that Lux Woods has many styles to suit everyone’s taste. One of their most versatile watches is the Gaston Wood Watch. It is handcrafted out of high-quality Zebra wood and is available in 7 different colours. For an additional $24.97 you can interchange your band. Get your fave colour, or get them all. I love how for a small amount, you essentially get a new watch. 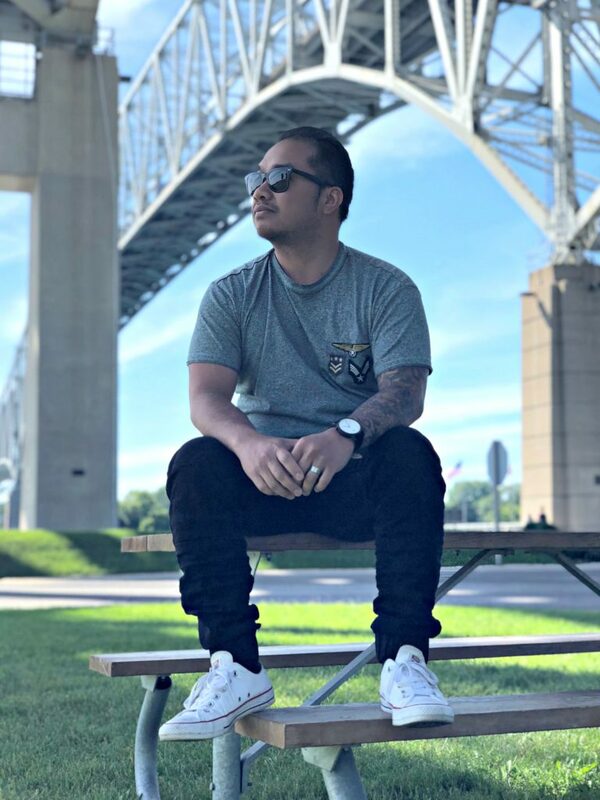 The bands are available in Concrete Suede Leather, Brown Suede Leather, Black Suede Leather, Orange Suede Leather, Grey Canvas, Olive Canvas, Blue Canvas. The leather bands are interchangeable and you can swap them as often as you swap your outfits. With the Gaston watch, you don’t only have to reserve it just for casual clothes, in fact, you can sport it with a dressier outfit. So whether you’re rocking a tee, hitting the town, or going out on date night–the Gaston Wood Watch will shine. 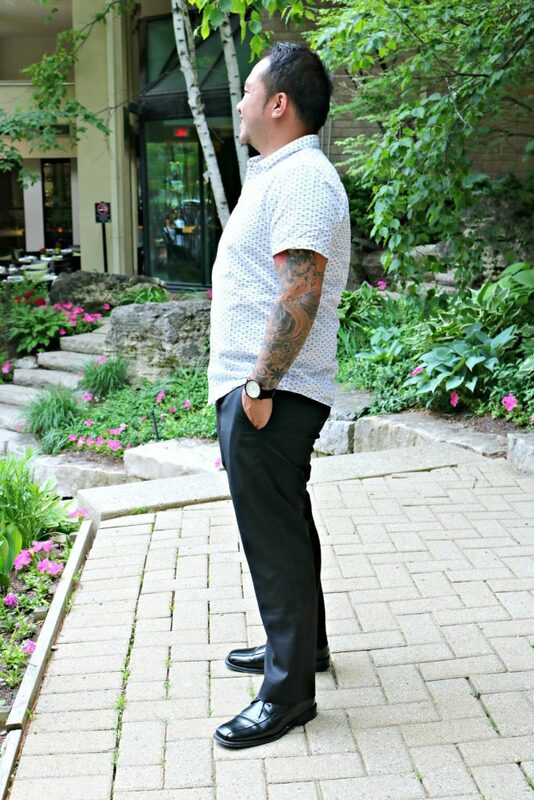 Darasak has been rocking it day to day and on date nights. 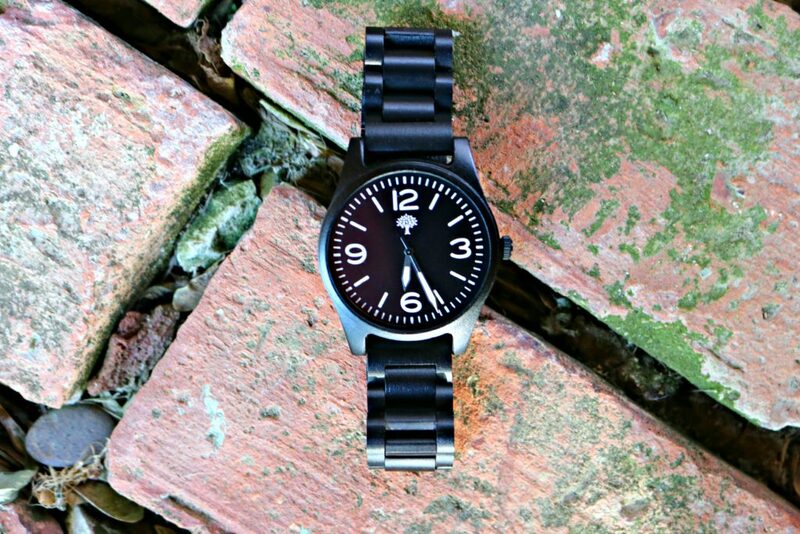 Weighing only 80z, this watch is lightweight and the leather straps make it super comfortable. I also find that wood watches are rare and unique. People notice and they are blown away at how gorgeous a wooden timepiece is. Since they are made out of wood, that means that each piece is unique. They are handmade and since not one watch will ever be the same, you can guarantee that no one else will have the EXACT same watch as you. 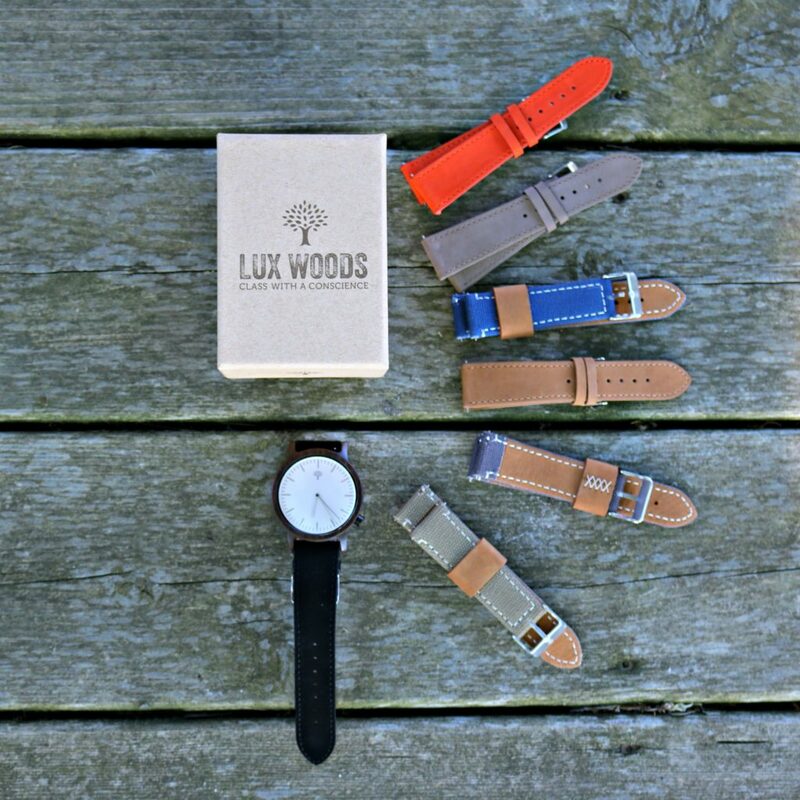 What sets apart Lux Wood Watches is the fact they are so customizable. One of the biggest ways to customize each timepiece is by using their option to engrave the case back. For an additional $15, you can engrave it with quotes, names, dates, logos, etc. 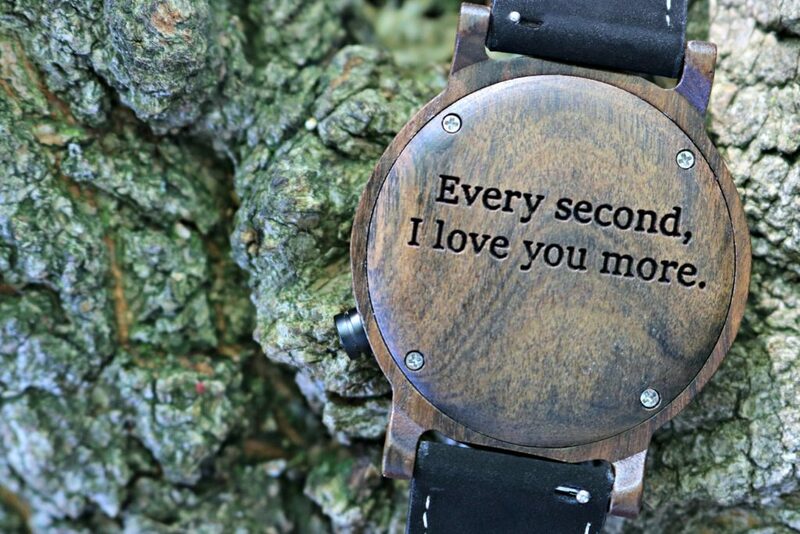 I chose to engrave the Gaston Wood Watch with a quote for my husband, “Every second, I love you more.” Well, because, we are mushy like that. I adore the notion that every morning when he goes to put on his watch, he will see that thought and know he is loved. 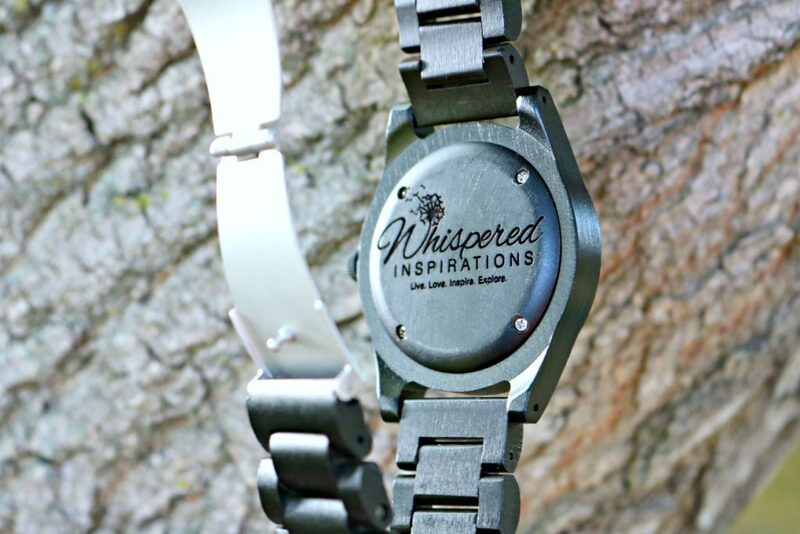 On the Pilot Wood Watch, we chose to engrave the Whispered Inspirations logo. Simply because our small business has been such a large and significant part of our lives. I am blown away by the quality since my logo has very small and intricate details. It came out PERFECT and flawless, which is quite impressive. For a watch lover, you can bet that among our collection you will find a smartwatch. The nice part of having a smartwatch like an Apple Watch is that it can be used daily if you want. It can keep up with your day to day life and send you notifications so you’re always connected. It is actually one of my favourite watches to wear. Luckily, the bands are interchangeable and Lux Wood Watches has wooden bands that take them to another level. Both Darasak and I tried the band out on our smartwatches and I love the fact that the band fits comfortably and is super lightweight. Opposed to rubber bands, I feel the sweat, slipperiness, and tightness. 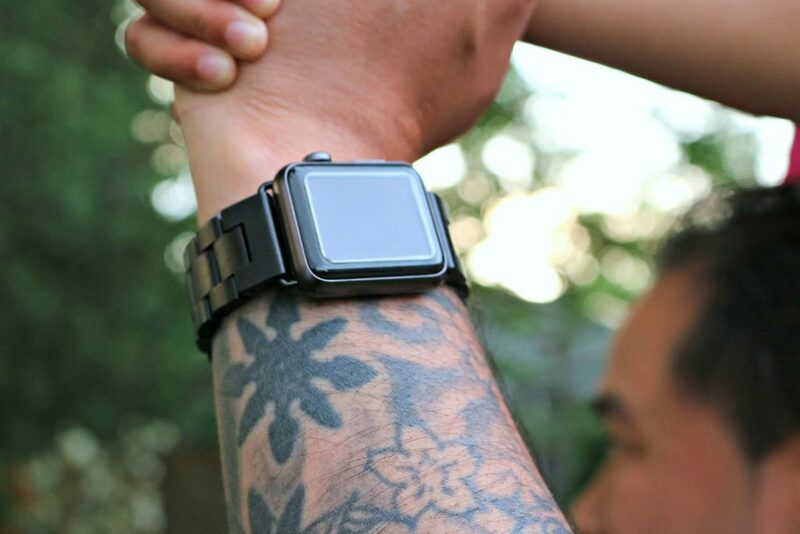 The Apple Watch Bands are $59.99 for the 38mm and $64.99 for the 42mm. So, they are well on-point with the price in my opinion. They come in several colours and wood offerings. I chose the African Blackwood wood and I think it’s a beaut. I especially like the stainless steel butterfly jewelry clasp. It makes it much easier to put on. It also comes with 42mm adapters in case you don’t have the 38mm like we do. Who doesn’t love a watch that looks good and is easy on the wallet too? Especially when they can boast the high-quality, attention to detail, and style that they do. 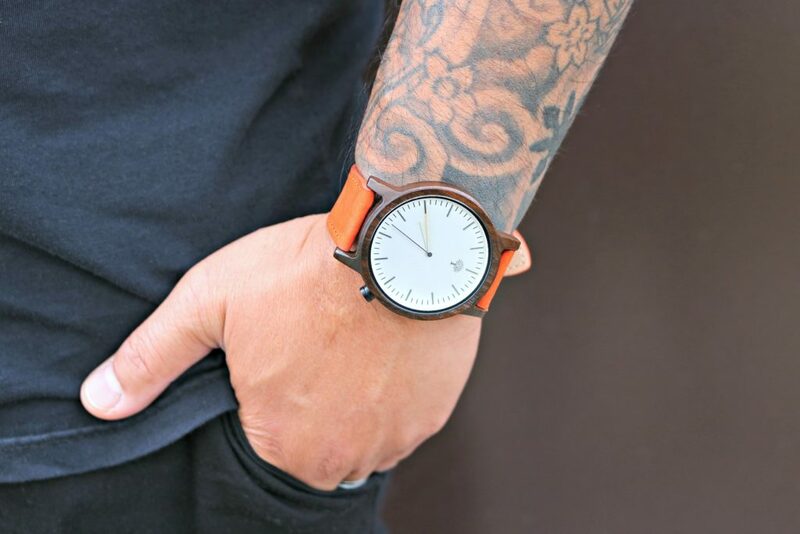 Lux Wood Watches range from approximately $69-$100. The Gaston Wood Watch is $71.97 and the Pilot Wood Watch is $79.99. To me, that’s a great price for the handcrafted design that you get. Now the Pilot Wood Watch is classy, sophisticated and beautiful. It is made from African Blackwood wood and is handcrafted. It glows at night with its glowing LUM Dial. The watch has classic pilot styling with large and over-sized numbers. To me, the face of the watch is just stunning. You can adjust the watch simply by removing the wooden links. 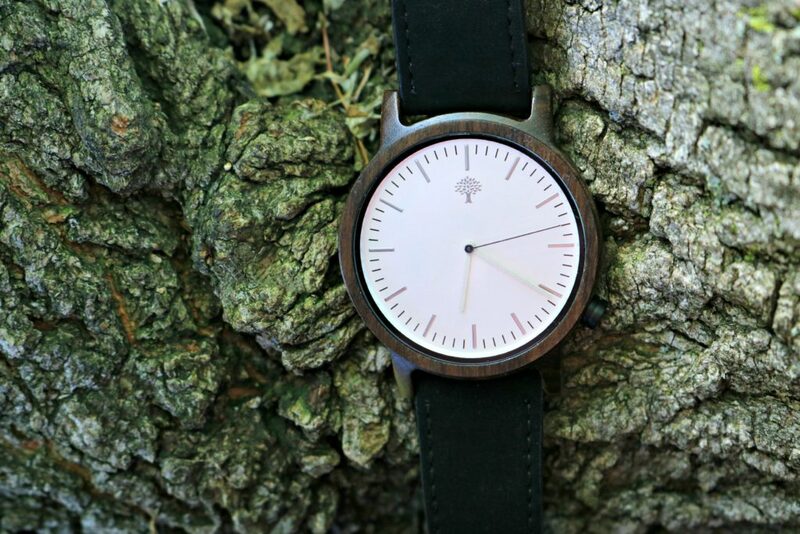 Lux Wood Watches are crafted from a sustainable, renewable resource–wood. Not only making you, the wearer, environmentally conscious but, allowing you to be a part of helping the environment. 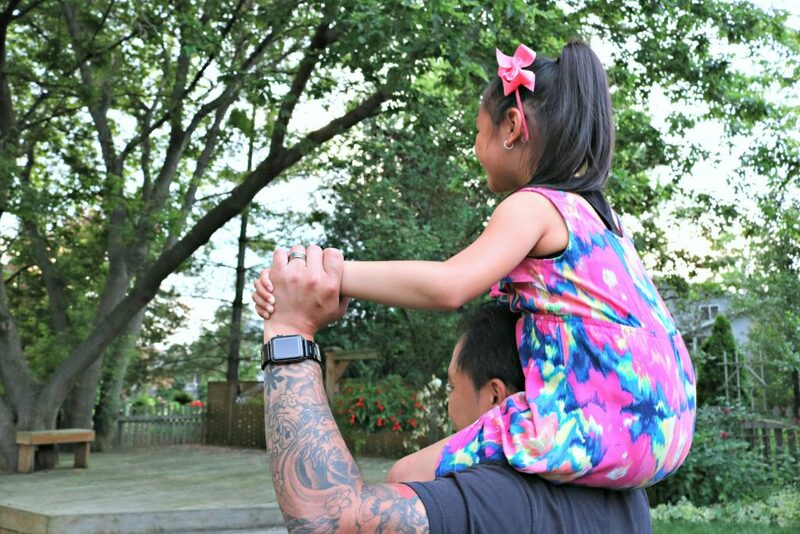 Their philosophy is “Buy one, Feed one, Plant one.” When you purchase a Lux Woods watch, you do something small to make the world a better place. Lux Wood Watches works with a couple of carefully chosen foundations like FeedTheChildren.org and PlantABillion.org that share their vision for the future. I love supporting companies that give back and can’t wait to buy Darasak’s next watch from them too. It’s easy to fall in love with Lux Woods Watches. Like they say–they are class with a conscience. 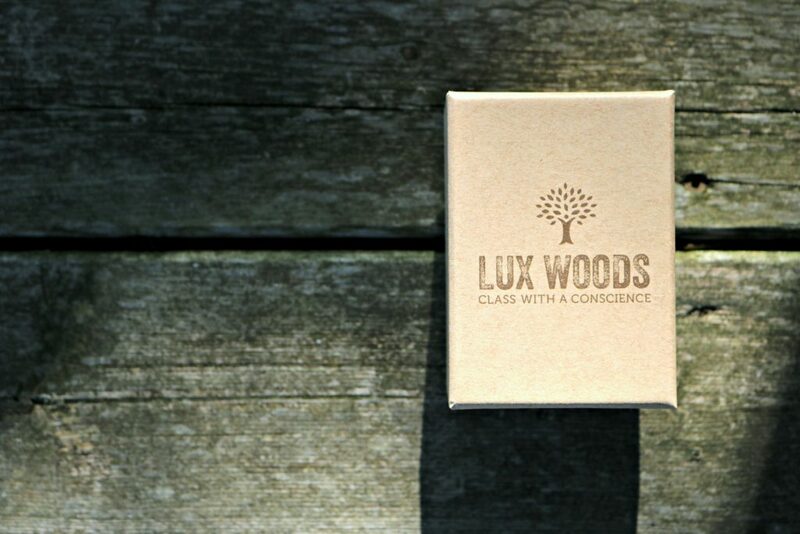 Visit luxwoodwatches.com for more information and to take a look at their selection for men and women. 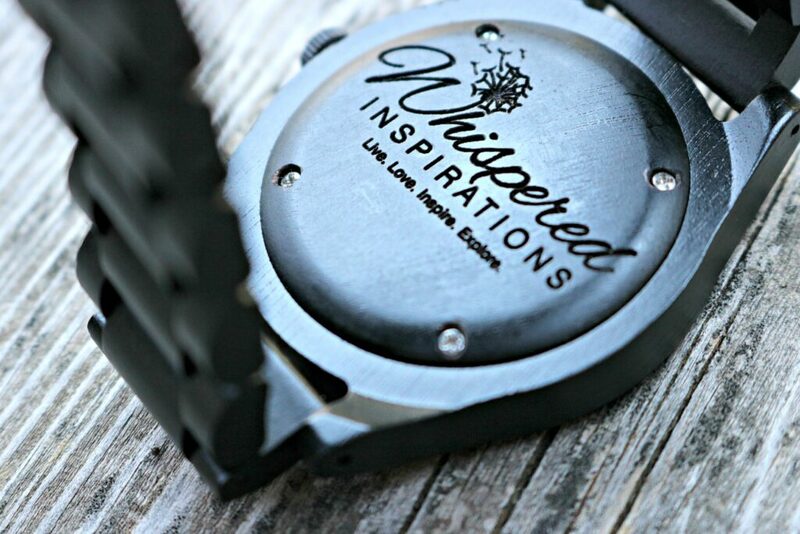 Two lucky Whispered Inspirations readers will enter to WIN their own Lux Woods watch. This contest opens on July 10, 2018 and ends on July 27, 2018. This giveaway is open to US/Canada only! Don’t forget to get social with them on Instagram, Facebook, YouTube, and Twitter. Have you ever owned a wood watch? Good morning Nancy,I would choose the THE GASTON WOOD WATCH- CHANATE WOOD- ORANGE- WOOD BAND! I love the The Gaston Wood Watch, Women’s Model, Chanate in Blue Canvas. It is so pretty. I like the Glenwood Wood watch in Zebrawood. I would love to add the classic The Gaston Wood Watch- Womens Model- Chanate- Black Leather watch to my collection. I would love to add the THE KERR WOOD WATCH – CHANATE to my collection. I like the black on this wood watch. I usually end up buying wood watches that look like wood. I’m going to buy this one the next time I need a gift for a guy. Awesome, they have plenty of colours to choose from. Always nice to shake it up. THE MEN’s OAKWOOD WOOD WATCH – BLACKWOOD because it has big easy to read white numbers on a black background. Too bad the Watches don’t come in digital. I love the THE KERR WOOD WATCH and the THE GASTON WOOD WATCH!! Wow, these watches are so beautiful and it looks like a perfect gift for my dad and my husband’s birthday. I do love the designs it so unique and the versatility of these watches. Yes, I love them too! I would love to add The Parkchester Wood Watch – Chanate – Womens to my collection. I like how you can change the strips depending on your outfits. Glad to learn about this brand here. Yes, it is a nice way to shake it up. I like the orange Gaston Watch! These are beautiful watches! I like that it has interchangeable bands, the fact that it is handmade and that you can put a quote in it. These watches would be the perfect Birthday Gift for my father at the end of the month and I love the saying on the watch. With all the different bands available this would be a fun watch to own. I like the big square looking watch the best. Sure any guy would love wearing this great looking watch. Such nice looking watches! thank you for sharing! This is such a pretty watch for me. I really want it because I can customize the name at the back that I want to engrave and I can choose the color of band that fits to my dress. Perfect! It having a customization option is such a huge plus. The watches look amazing and the outcome of your business logo is stunning, they even got the little details precisely. Thank you, I was truly blown away by the quality. I love how my logo turned out too! These look like nice watches. I don’t have anyone to buy these for but if one does I’m sure it will make a nice gift. Well, they do have them for women too. So, gift yourself m’dere! Beautiful. I have a wood watch myself and love it. It’s so beautiful and unique. They are beautiful. I own some too. What a nice watch! My husband would like one of these. I’ll have to enter the giveaway for sure. These Lux watches look amazing. I love how big their faces are and the engraving at the back. Also loving the interchangable straps. Yes, they are truly gorgeous! I absolutely love what is written on the inside of the watch. 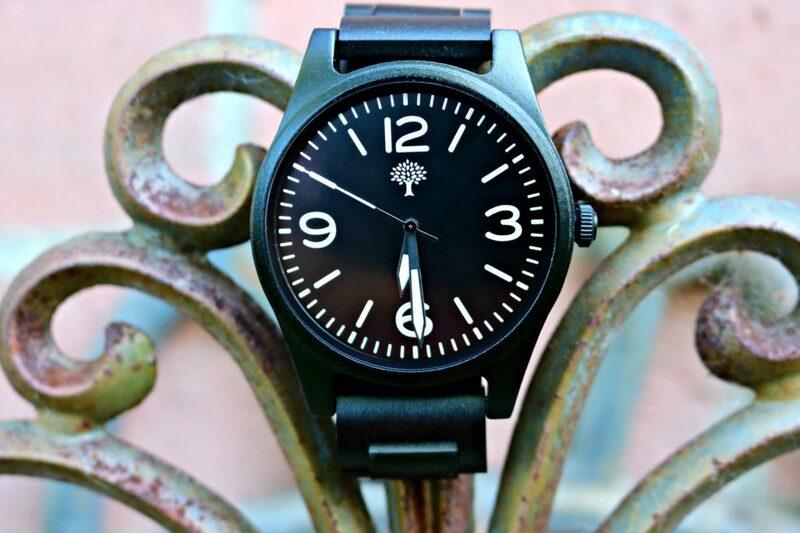 These are some really beautiful watches that would make such an awesome gift! That’s a really nice watch, and its great that it can be a “smart” watch too. It is difficult to find affordable “smart” watches. Yes, with the band, you can turn any smart watch with a wooden touch. These watches are beautiful. I love the orange band! Yes, the orange is one of my faves. You can see that the design is exquisite and that the quality is amazing! I think it’s awesome that you can customize it to your liking as well. The bands are great too! Thanks Karen, I completely agree. What beautiful and unique watches! It is nice to have a meaningful time piece, especially when it comes to gift giving. Thanks for sharing! I completely agree, my pleasure. I’m a guy with a huge watch collection. Wrist watches are the fashion accessory for me what ear rings are for my wife. I don’t have one of these watches but I’d wear one. Nice look to it! It’s really cool that there is an option to add words to it. Such a perfect gift idea! I agree, it makes it such a meaningful gift to give or receive. I’d like to get the THE GASTON WOOD WATCH- WOMENS MODEL- CHANATE- ORANGE LEATHER. My hubby would love these, he is such a watch guy. So of course, I entered your giveaway! The Lux Wood watches look fabulous. What I really like about them is they have a certain vintage charm and elegance. The designs are all lovely and classy. Yes, they really do. You said it perfectly. What a stunning watch! I absolutely love the minimalistic vibe on the face of it- and that inscription is so sweet! Saving this for a holiday gift idea! Hehe, thanks… I am sappy so, I added that. I like The Gaston Wood Watch- Women’s Model- Chanate- Brown Leather for sure. Love all their watch styles. And I like that you can change your watch because they are so affordable! Makes for a nice gift!! Yes, I love how you can interchange the strap. These are such pretty watches! I love that you can have them engraved on the back with meaningful messages. Yes, that makes them so unique and special. I like the style of the THE GASTON WOOD WATCH- WOMENS MODEL- CHANATE- BLUE CANVAS. What cool watches! I think my guy would like to get one for Christmas! It makes a great gift, especially with the engraving. I love wood watches! They’re very fashionable and surprisingly light on the wrist. I got one as a gift for my husband two Christmases ago and it’s become his favorite. He gets so many compliments on it being made from wood! Yes, my husband looooooves his Gaston. He wears it every day. Wood watches have such a humble look about them. I really do love the wood style. Hmm, I think they look very unique and high-quality. Since they are made of such a unique material. I love it too. I like the KERR WOOD WATCH – CHANATE. I would like to add the THE BOYLAN WOOD WATCH – BLACK & GREY to my collection. I know so many with Apple watches, that is so cool that they make bands for those! These are pretty cool looking, and I like the look of the different bands. Yes, it is awesome! It is very comfortable. 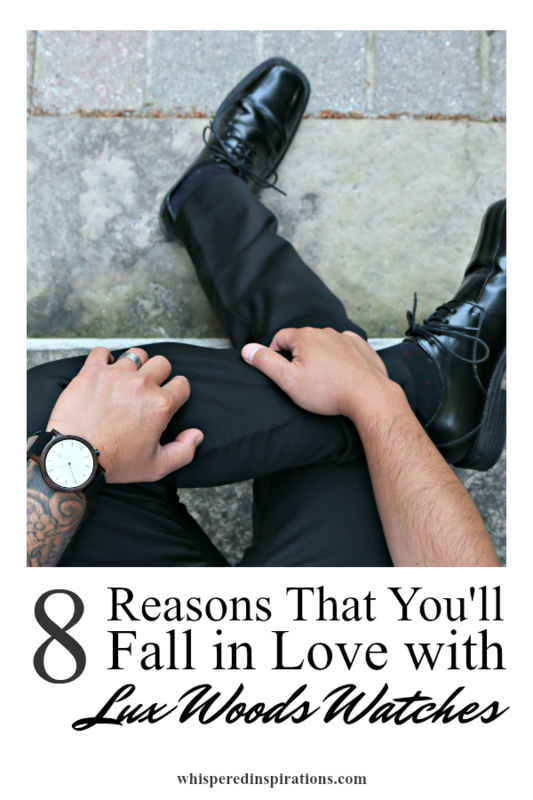 My husband loves watches and this brand looks like a good one! I love that you personalized it on the back! Thank you, it was one of the highlights of an already beautiful watch. I would love the The Parkchester Wood Watch – Chanate- Womens watch. I think it’s really sweet that you can have a personalized message for your loved one when giving them one of these watches. The designs are beautiful! I love them! Thanks, I think it is a great feature to have. I think that I would choose the GASTON WOOD WATCH- WOMENS MODEL- CHANATE- BLACK LEATHER. I just love the THE PARKCHESTER WOOD WATCH- ZEBRAWOOD!!! Thanks! i like the The Kerr Wood Watch – Chanate because it looks so classic and original. I love the wood color can go with any color outfit! I would love to add the THE BENDEMEER WOOD WATCH -in NAVY BLUE to my collection! These watches are fabulous!!! 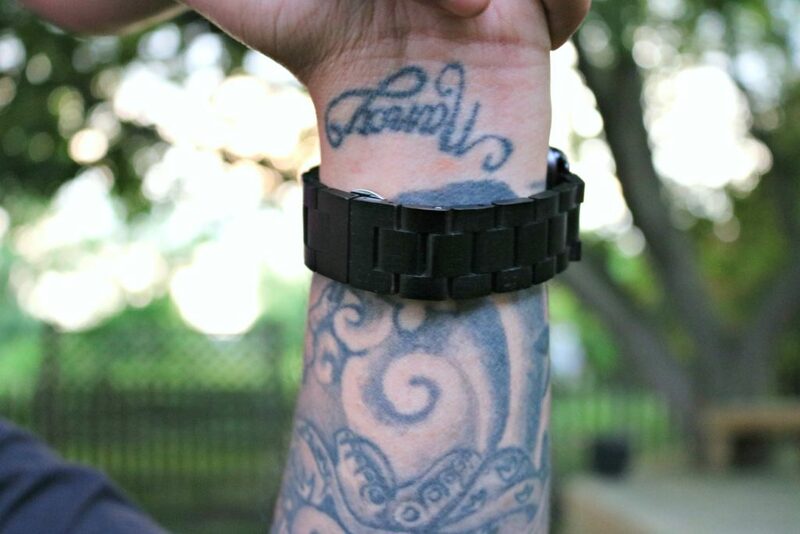 My favorite style is the Bendemeer Wood Watch – Black Leather. It’s so understated and rich looking. The watch that I really like is the men’s Oakwood Wood Watch-Blackwood. This would look great on my husband. I really like the Oakwood Watch-Blackwood. Great for my husband. I love the Kerr watch, so feminine and pretty. I like the Oakwood watch. They have some gorgeous watches! The first one I would have to have is the THE BENDEMEER WOOD WATCH – BLUE. – the blue face really pops with the wood. It’s beautiful! These are some beautiful high quality watches. I would let hubby choose his favorite. I learned that the trees were replanted after watches are made with a sustainably sourced wood. 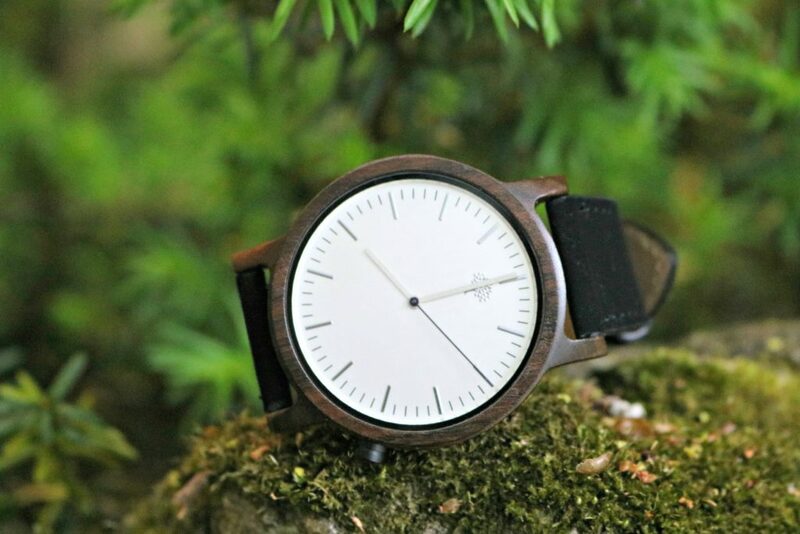 I have fallen in love with the THE BENDEMEER WOOD WATCH. The Blue Womens is gorgeous. Did yall check that one out? I really like the Bendemeer Wood Watch. They are all gorgeous! I would love the The Gaston Wood Watch- Womens Model- Chanate- Black Leather ! Gaston: Orange looks amazing love to wear one .